I love Buffalo chicken in all shapes and forms. It's one of my favorite flavor profiles, and I'm always looking for different ways to adapt my favorite dishes into Buffalo versions. 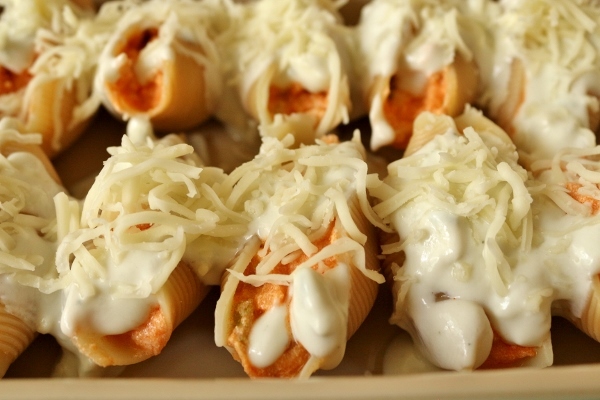 When faced with half a box of jumbo pasta shells recently, I decided to stuff them with none other than spicy Buffalo chicken and creamy ricotta cheese. Tangy homemade blue cheese dressing, and gooey mozzarella finish off the dish, yielding a real winner in my book. 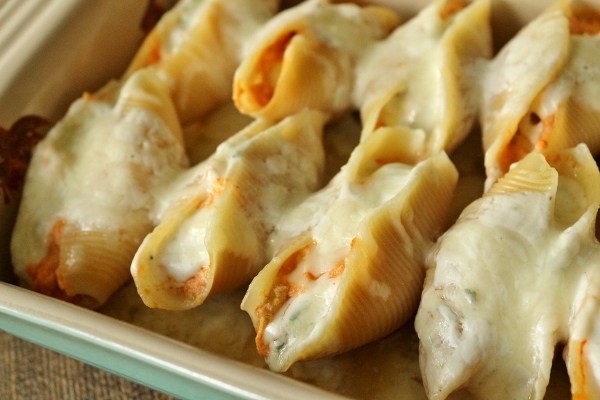 These Buffalo chicken stuffed shells are super easy to make, especially if you already have some cooked chicken on hand to shred, but it's easy enough to cook a chicken breast or two and shred them up for this purpose. Many stuffed shell fillings include an egg to held bind the mixture, but I left that out of mine. I liked that the filling was somewhat looser and creamier, but you can easily add a beaten egg if you want your filling to hold together a bit more. It's really not necessary in my opinion though. I use homemade blue cheese dressing as the "sauce" on top. 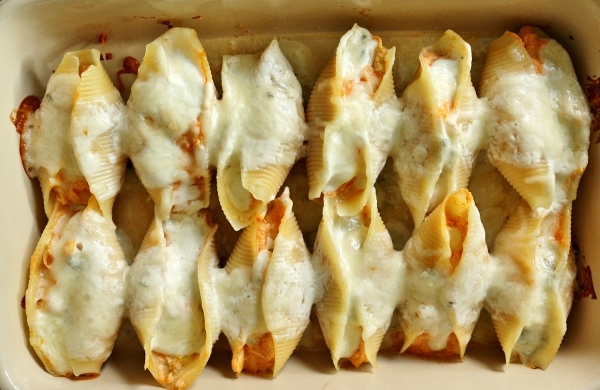 I've seen other similar recipes online that don't really have any type of sauce, and I always feel this yields really dry shells, even with a sprinkle of cheese on top. 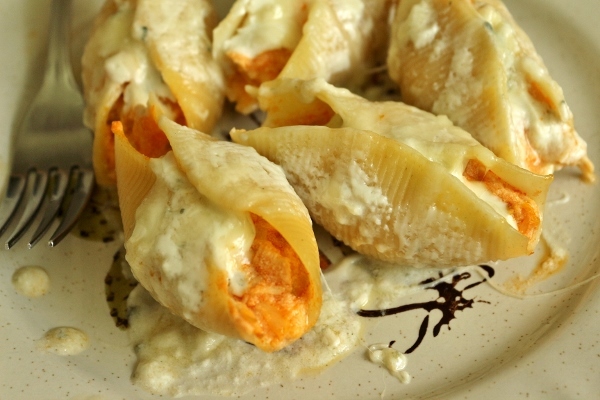 The creamy sauce that results from a combination of the dressing and shredded mozzarella is true perfection with the al dente shells and spicy, but luscious filling. 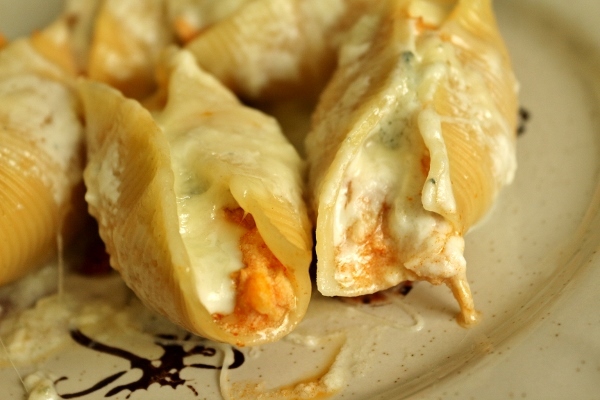 A bit of crunch from the chopped celery is the final touch to these excellent crowd-pleasing stuffed shells. Serve them as an appetizer/snack at your next game night or sporting event, or enjoy them for dinner with a crisp salad on the side. 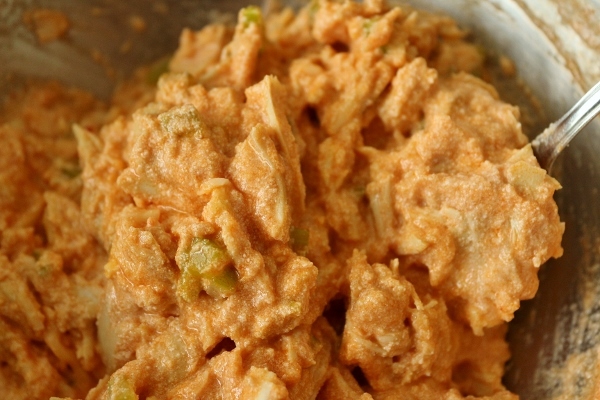 Either way, they are definitely an easy-to-prepare rendition of my beloved Buffalo chicken. Preheat the oven to 375 degrees F with the oven rack in the lower third of the oven. Lightly grease a large baking dish (or a couple smaller ones--I baked two-thirds of my shells in a 10 1/2-by-7-inch baking dish, and froze the rest in a 7-by-5-inch baking dish). Boil the pasta shells in generously salted water for 1 minute less than the package directs. Drain and remove the shells to a tray or baking sheet so they are spread out and do not stick to each other. Allow them to cool. Heat the olive oil over medium-high heat in a skillet and add the celery, cooking for about 5 minutes, stirring occasionally until crisp-tender. Remove from the heat and add to a medium mixing bowl along with the shredded chicken breast, ricotta cheese, 1/4 cup of the mozzarella, the hot sauce, and the crumbled blue cheese. 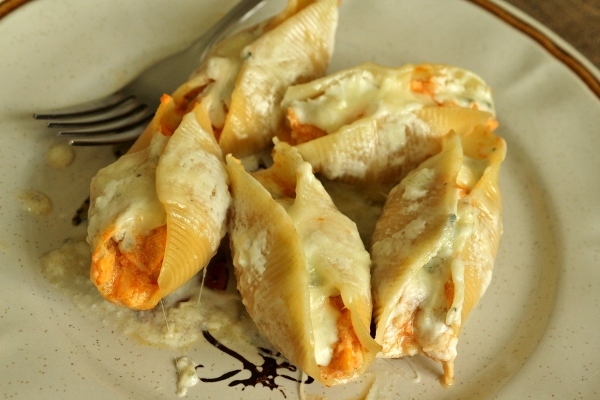 Spoon the chicken mixture into the cooked pasta shells dividing the mixture evenly. I yielded 19 stuffed shells. 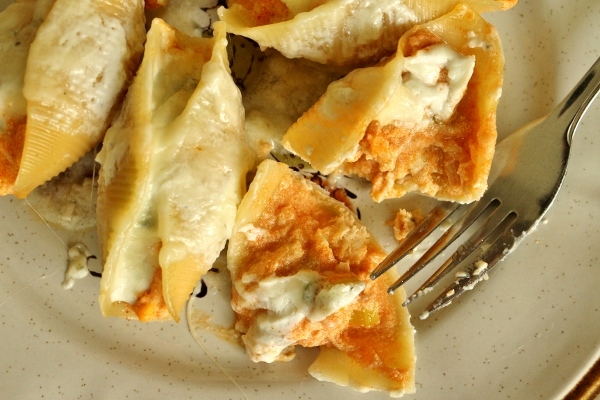 Place the shells into the greased baking dish and drizzle the tops of the shells with the blue cheese dressing. 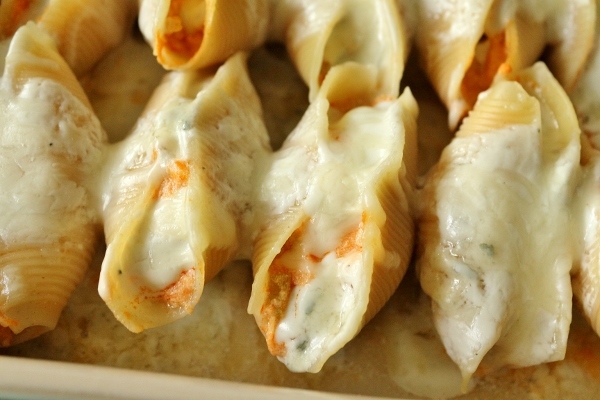 Top the shells with the remaining 1/2 cup shredded mozzarella cheese. Cover the baking dish with foil and bake for 15 minutes, then uncover and continue to bake another 10 minutes or until bubbly and heated through. Serve immediately. *Note* You can easily double this recipe and use an entire 12 ounce package of jumbo pasta shells.